100 billion business-related emails are sent every day. That’s according The Radicati Group in their report Email Market 2013–2017. As a business user, you want the ones that are addressed to you to arrive instantly. So when a business email provider like Google Apps or Microsoft Office 365 offers you a 99.9% uptime guarantee, that could certainly sound like it’s reliable enough—that is, until you do the math. This equates to us saying that you should expect less than 10 minutes of downtime over the course of a year—and, if we should fail to deliver, we’ll compensate you for it. Three nines vs. five nines: it’s a difference that may not seem significant in your decision-making process… until the day your email is down for four hours. That paper is a bit technical, though. So why not call our sales team at 800.379.7729? They can tell you all about our cloud infrastructure AND our 99.999% SLA. 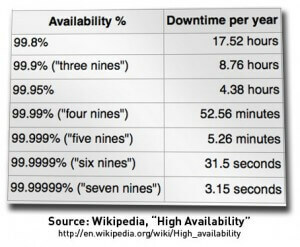 Also, if your current provider only offers “three nines”, make sure you ask about our free migration services. We’ll actually do the heavy lifting to get your data into our “five nines” environment—at no additional cost.